We finally got enough snow to go out and play in. 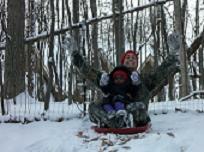 At first Asha didn't know what to think of it other than it was really hard to walk in but once daddy got her on that sled and they went down a few times she was all for playing in the snow. We didn't stay out long though because they don't make good winter gloves for 1 1/2 year olds and her hands started to get wet and cold. She however did NOT want to go in. 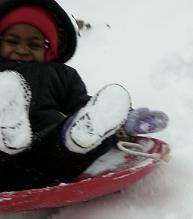 She was having so much fun and just wanted to keep going down in the sled. Unfortunately big brother wasn't home to enjoy this with us because they would have had so much fun together. We even put Asha not even half way up the hill and let her go down a little ways by herself and she was just squeeling with delight. My camera wasn't fast enough to catch all of her but I got most of her going down by herself. I can't wait to go out more. There is a bigger hill not far from our house that we want to take both kids too. I'm sure our little adrenaline junky will love it. We looked at a place today and decided to buy it. It's alot less to handle than our current home and since my husband travels so much I just can't keep up on my own. It is right in our little town so Dakota will be able to walk to school and his Tae kwon do class. This way I won't have to wake Asha up from her naps, when she actually takes them, to go and pick him up from his after school activities. We are pretty excited and I like the neighborhood ALOT. It should really make life a little easier and we'll have more family time to spend together which is what is important to us. On a side note the kids made out for Christmas and our home is full of toys. I'm sure you all have this problem as well. We just took a load to my inlaws house of toys that are still in good condition but the kids don't play with and they will distribute them to needy families from their church. I hope everyone had a wonderful Christmas and you all have a wonderful new year!!! I will post a picture late when I have more time!! Check back for pictures! !